The Blogger problem, you ask? Well, a number of people recently posted on the Google message boards about an odd issue on Blogger (Google’s free Blogging platform) that spoke of a problem with uploading images to Picasa (Google’s free web photo sharing application and Blogger photo repository). In the past – blogger would upload images and place them in a folder on Picasa that was named after your blog – in the case of this blog: “Blogging Calwell”. 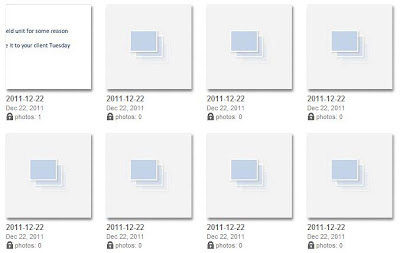 On or around Dec 22, 2011, Blogger started creating new folders in Picasa for each and every picture you uploaded. Wow, if you hadn’t noticed this earlier, your Picasa interface is about to become incredibly unwieldy. I’ll show you a short-terms fix to this issue to begin with and then look into some of the more interesting ramifications to this problem.